It is very rare to find a small automatic in such good condition. Both interior and exterior are immaculate without any marks, dents, stone chips or dead flies! The car is taxed until 31 July 2011 and then will cost only £100 for the year or £60 for 6 months! The fuel consumption is around 44-45 mpg around town and 50-53mpg on a good run (again, very rare for an automatic to return this sort of consumption!) - It is also very cheap to insure this vehicle. The MOT expires 17th September 2011. The car has been serviced at regular intervals and the service book is fully stamped... the last full service was at 57,000 miles. 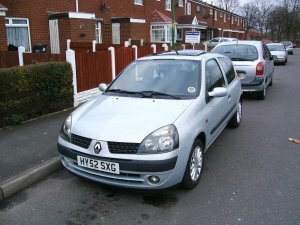 You can also have peace of mind that this car is not going to suffer the common Renault electrical faults as this happened to me recently and i paid £300 for a new fuse box and electric wiring - I have receipts to confirm work carried out - I have also recently fitted a brand new battery to the car. All in all a very good car that has been well looked after, anything that has needed servicing to seeing to has been done straight away without hesitation of cost. Selling as i now need a bigger car - will be sad to see it go! I would like as close to £1995 as possible. More pictures available upon request, first to see will buy!